A Review of The Eat-Clean Diet Recharged & a Recipe! 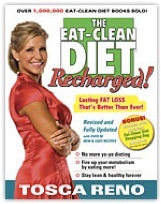 The Eat-Clean Diet Recharged Review & a Recipe! The idea of eating “clean,” is pretty brilliant. It basically means eating foods that are minimally processed and natural (read: healthy), and, really, when you think about it, who wants to eat “dirty” food? Not I, said the Fit Bottomed Girl. That’s why today we’re following up yesterday’s interview with the lovely Tosca Reno with a review of The Eat-Clean Diet Recharged book. First off, if you’re confused about nutrition or would like to learn more about food and how it can affect your health, weight and mood, read this book. It is a fantastic beginner’s guide to building a lifestyle eating plan that you can live with and feel good about. From fantastic info on metabolism to proper hydration to how to make the most of your workout time, it’s a sane approach to living well. Tosca is definitely all about moderation, and the book is chock-full of fun tidbits and tips that almost feels more like a fun magazine than a book.Which kind of makes sense since she has rocked the pages of Oxygen magazine. There’s even a FAQ section that is AWESOME. The Eat-Clean Diet Recharged also includes a bunch of recipes that are pretty tasty. The hubs and I tried the Miso and Salmon Stew and it was delish. We also tried the Sweet Potato Oat Bars, which have become a breakfast staple at FBG HQ (more on that later). I will say that if you’re a newbie cook, the recipes may be a little challenging, as I found some of the cooking times to be off and some of the instructions to be confusing or misleading (the Salmon and Miso Stew we made was delicious but it looked nothing like the photo). But if you know your way around the kitchen and don’t mind having to improvise (or using your best judgment in a pinch), have at it. The results can be delicious. 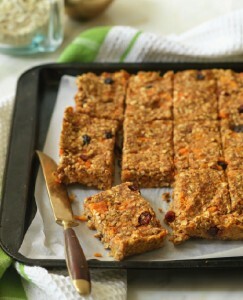 With that said, I’m super happy to share the recipe for the Sweet Potato Oat Bars! This recipe is pretty foolproof, although I added a few notes below for clarification. An entire pan makes 24 2-inch-by-2-inch squares and the entire process takes a little more than an hour. Each serving has 189 calories, 6 grams of protein, 5 grams of healthy fat and 4 grams of fiber. Happy and healthy noshing! 1. Preheat oven to 350ºF. Prepare a 9” x 13” baking dish by coating lightly with olive oil. 3. Add all remaining ingredients to sweet-potato mixture. Mix well. 5. Remove from heat and let cool. Cut into squares. Want to read the book yourself? Enter a comment in the next week, and we’ll select one lucky U.S. reader to win a copy! The winner will be notified by email. Happy commenting!